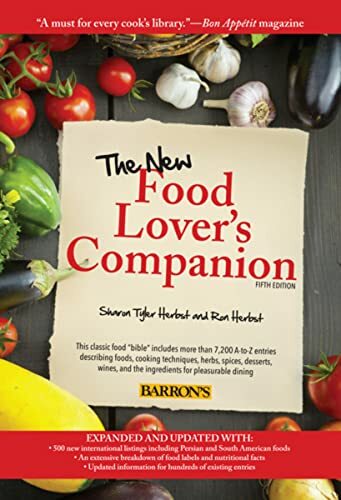 [PDF] The New Food Lover's Companion,5 edition | Free eBooks Download - EBOOKEE! Description: The fifth edition of this widely praised and highly esteemed reference guide has been updated with new information to reflect the way we eat in today's world. The authors have taken into account our healthier lifestyles and more diverse palates to include: â€¢ Over 500 new listings, including Korean, Persian, and South American additions â€¢ Updated information for hundreds of existing entries â€¢ A blood alcohol concentration chart for men and women â€¢ An extensive breakdown of food labels and nutritional facts â€¢ Department of Agriculture recommendations for a 2,000 calorie per day food plan Among the myriad foods and culinary subjects defined and explained are cooking tools and techniques, meat cuts, breads, pastas, and literally everything else related to good food and enjoyable dining. Handy appendices cover many topics including suggestions for substituting recipe ingredients, a microwave oven conversion chart, recommended safe cooking temperatures for meats and fish, and much more. No comments for "[PDF] The New Food Lover's Companion,5 edition".